Little did I know that a few short months after starting this blog that my life was about to be turned upside down. Little did I know that I would be diagnosed with a chronic pain condition and that everything I knew about my life was to be forever different. Did you see what’s at the very top? RSD. 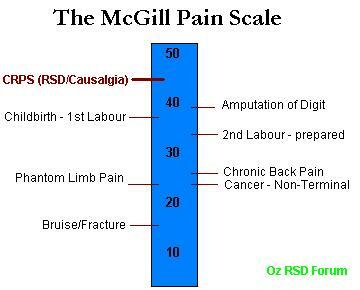 Yep…it’s the highest on the pain scale. More than childbirth. More than cancer pain. More than a broken bone. So, I haven’t written anything. I’ve been silent. I mean, I haven’t been baking or cooking because I can only stand for a few minutes at a time before my foot turns completely red and swollen. And if I’m not baking, then I’ve got nothing to share. Right?! Why is this happening to my family? Doesn’t Mike have enough to handle? Would life for my family be better without me? Then they wouldn’t have to take care of me or worry about me. And after a lot of these questions to God and lots of tears, I began to hear God’s still small voice. You do have something to share. Not what you had originally planned, but I’ve got something more. So, I’m back. I’m sorry that it won’t be about cooking or baking. I know I’ll probably lose some of you because of changing my theme about baking, but that’s okay. From here on out, this blog will be about the struggle I have with RSD, the pain and frustration it causes our family, but the hope that there is Something bigger. That God is bigger. That He is my Hope. on September 13, 2010 at 6:41 pm | Reply Ashley C.
While I loved reading about the recipes and hoping you would soon bring somoe of it to church to share(since I can’t bake) I believe this will be just as good of a blog.. I know that as far as pain wise, what I have and deal with does not compare to yours, but I can understand the questions you ask. I look forward to reading your new blog, and I like the name as well. I’m ready to take this journey with ya sister. Look forward to reading….. I am thinking and praying for you, and your family. If you need anything please let me know. Shara – You’re pretty cool! Many would cover their head and choose not to talk about their pain. Praise the Lord for people like you who care enough to share. Perhaps you’ll never know how many you have touched throughout this ordeal. Your little Reagan is a sweetheart! I so enjoyed having her sing with Joyful Noise this past Thursday. She may have noticed a lady rubbing a man’s head in the audience – she happened to be a nurse at the facility and she was at church on Sunday, Please tell Reagan that she asked if she could sing with us – she thought we were having so much fun and she loved the children. We can be an outreach ministry afterall! Praise the Lord. Please know Shara that I am praying that God will heal you – if that isn’t what He has in mind, then perhaps He will use you just as He is doing now to tell people of your love for Him, your love for your husband and your children.Rest assured that you are loved, you are forgiven and He has a plan for you. sharon w.
Shara: I think and pray about a lot. Try to keep in mind God never gives you more than He will give you strength to endure. I say this lovingly. As far as your recipes. Being diabetic, I can only drool over the good things you share. I won’t say I’m glad they won’t be there, but I just won’t be drooling as much. Please continue to share whatever is on your mind (and on your plate to deal with) and I will still enjoy hearing from you. Send me your email so I can let you know about my latest post!